Led by Christopher Hodkinson and Fr Guy Nicholls Cong. Orat. 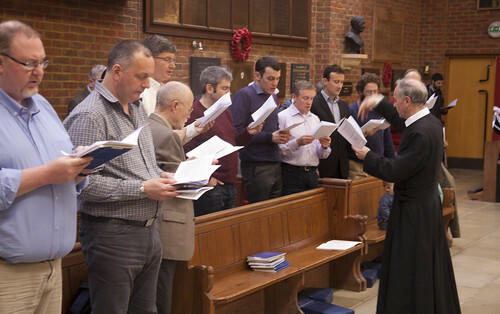 The Chant weekend, which returned to the Oratory School in 2017 after a break, was a great success with increased numbers. There is plenty of room in the Oratory School, the prices have been frozen, so we can continue to grow! The Course ends with Sung Mass at 11.30am followed by lunch on Sunday. Scholas must be registered with the Gregorian Chant Network: there's no fee for this, just email info@lms.org.uk for an application form. The 2018 PMMS study day accompanies the exhibition “Fragments of note: the afterlives of medieval manuscripts” at Magdalen College, Oxford, which examines the numerous medieval manuscript fragments held at Magdalen, largely medieval books that have been dismantled in the early modern period and re-used as binding waste or covers. The main exhibition focuses on fragments featuring musical notation and is complemented by a selection of contemporary watercolour, collage, and paper-pulp relief works by fine artist Janet Boulton.